Salem, located on the Willamette River in the northwest part of the state, is the capital of Oregon. This thriving city depends on state government and agriculture for economic support. This city of over 153,000 always has something going on - a festival, museum show, or some entertainment from the several colleges hosted in Salem. It has a park system with 46 parks encompassing over 1800 acres. Marion Square Park has a skatepark and permits bicycles. The climate is ideal with relatively mild winters and great access to outdoor activities, including biking. The Pacific Ocean and the Cascade Mountains are close. 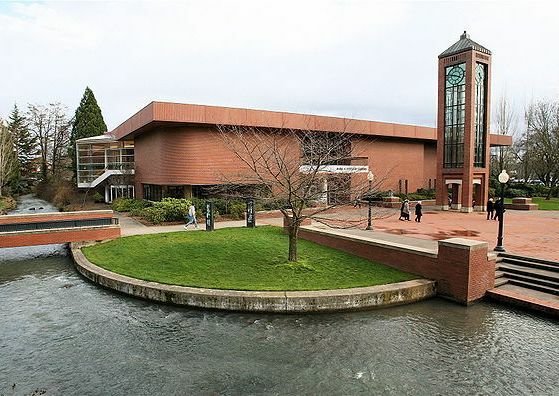 Photo of Willamette College Library courtesy of and per license of Wikipedia and Cacophony. There are 19 different neighborhood associations in the City. in addition there are some active adult and 55+ communities in Salem (see link at top right). The National Association of Realtors reports the median price of homes in the 3rd quarter of 2018 to be $307,300, up 12% from a year earlier. 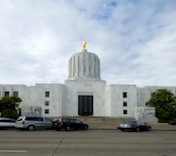 The state capitol of Oregon is in Salem. Huge park system with trails for hikers, bikers, and horses. Year round festivals including the Oregon State Fair. At least 3 colleges including Willamette College, Chemeketa Community College, and Corban College. Property taxes are high because much of the land is government (federal, state, county, city) owned and not taxed. Salem is one of the cloudiest and rainiest places in the country. While it is the capital it doesn't seem to have the life that Eugene or Portland have. The average July high temperature is 82 and the average January high is 47 (the average low is 33). The wettest month is December (6.5"). Salem's cultural resources include the Mission Mill Museum, Hallie Ford Museum of Art, and the Elsinore Theatre. The Oregon Symphony plays 10 classical concerts in Salem each year. The annual Salem Art Fair and Festival is a big event. In addition the local colleges have cultural events. Salem Hospital serves the community. Salem has local bus service with connections to Portland. Amtrak has daily service from Salem. The Salem Municipal Airport serves private aviation. The Portland Airport is the nearest big airport.